WeAreSC publisher Erik McKinney takes your questions regarding the world of USC Trojan football. This week, question topics range from picking a starting quarterback, to the defensive line, to defensive coordinator Clancy Pendergast. Q: It seems to be successful air raid offense needs a QB that has to make play call decisions and have athletic ability to improvise . If you had a lean who is your choice and do you think your choice will excel? A: There is still some time for this quarterback competition to go in a completely different direction, but I’d lean toward JT Daniels if I had to make a choice right now. I think the experience he got last year was hugely beneficial. He’s a little better thrower than Jack Sears and he had enough athletic ability to do the things this offense calls for from a quarterback. I think the possibility exists that Sears would have been the best quarterback in last year’s offense and Daniels could be the best in this year’s. But this all hinges on the idea of an improved offensive line. If the quarterback is running for his life again, then it’s probably Sears or Matt Fink. If things are steady up front, this offense is designed for any quarterback to excel. Q: What are your impressions so far of defensive line Coach K? Your recent article focuses on his stress on fundamentals, which is a good thing with so many young players. But that was probably only part of the reason our DL underperformed last year. Do you think our talented DL will excel this year in stopping the run and pressuring the QB under Coach K? A: I like what we’ve seen from Coach Kauha’aha’a so far, and the players seem to be responding. He talks a lot about gap control and stopping the run, two things that were missing during chunks of time last year. I really like what we’ve seen from Jay Tufele so far, but I’m going to wait to see if someone develops into a truly dominant force up front. The potential is absolutely there with this group, and I think it will be the best defensive unit, but I’m not going to guarantee anything yet. Q: Are you hearing any other news from the transfer portal besides the Tennessee O lineman? Any Velus sightings at practice or do you think that ship has sailed? 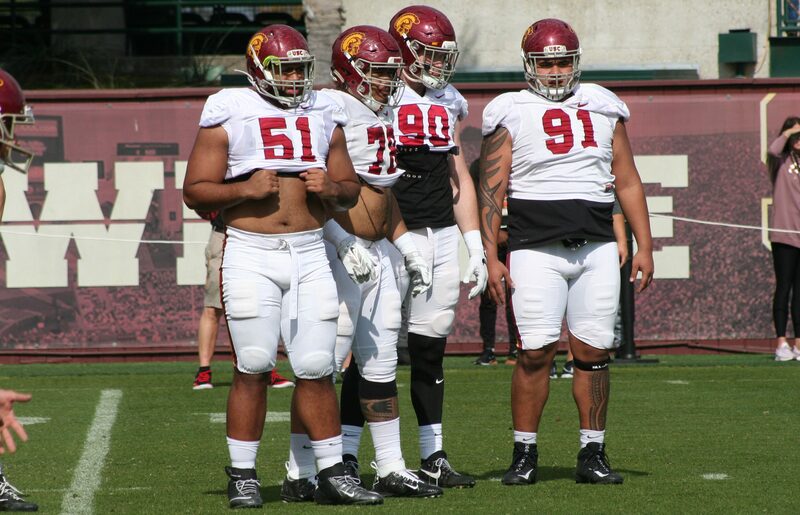 A: We haven’t seen any other potential transfers on visits this spring, but it wouldn’t surprise me to see USC chase another offensive lineman or two, just to up their chances of landing somebody. No Velus Jones sightings so far. It probably would have made sense for him to come back after spring break, if that was going to be his eventual plan. I’m not ruling it out completely, but I don’t think I’d expect him back at this point. Q: Any update on Drew Richmond, Grad Transfer OT from Tennessee??? A: Drew Richmond took a visit to USC this past weekend and is doing his due diligence in checking out a potential transfer destination for his final season. It will be interesting to see if he takes any other visits and what other programs continue to pursue, as we’ve seen a lot of offensive linemen dominoes fall already when it comes to transfers. I do think the visit put USC in a good spot with him, but I don’t know that he comes in and grabs a starting spot based on his history and what we’ve seen from the two starting USC tackles so far. Q: Any word on TE Daniel I? Is his SC career likely over? Q: Back in the day, (McKay and JR days) we used to recruit top JC talent to fill needs with experienced older players. We don’t seem to be looking at those ranks. Is there a reason for that? OJ was the most positive result of this practice. But OL and DL candidates would be fruitful resources. A: There have been a few junior college targets along the lines in recent years. Defensive linemen Caleb Tremblay and Nick Figueroa were both juco additions, while offensive tackle Bernard Schirmer was as well. USC also went hard after juco offensive lineman Malaesala Aumavae-Laulu in this past class, but lost him to Oregon. I do like the idea of bringing in a juco guy somewhere along the lines every year, just to make sure you have a new addition who is physically ready to step in should you need it. Especially because with players transferring so freely now, you might not get a shot to develop guys for three or four years to get them ready to play. Q: I know we’re supposed to put 2018 behind us, but since so many commentators I trust have made negative observations on last spring’s practices. Could you compare and contrast by position group for us. I’m really interested in first hand discussions of intensity and scheme. A: I wasn’t at last year’s spring practices, but from speaking with people who were, this spring has a lot more energy to it. We’ve also heard from Clay Helton that they are spending a lot more time doing individual drills, as coaches work fundamentals and technique. Q: I love the competition at the quarterback position, but what about the offensive line? Is there any competition for the right guard and tackle positions. Especially since the OL was a weakness last season. I see Andrew Voorhees is listed as a starter, but wasn’t he one of the weakest link last year? How come he’s not being challenged for his position? A: If there have been instances of backups working with the first team along the offensive line, I’ve missed it. Jackson, Vera-Tucker, Neilon, Vorhees, and McKenzie have been the clear starters along the offensive line. That doesn’t mean coaches aren’t grading all the players and a second-team guy could very well be challenging a starter, but there haven’t been instances (that I’ve seen, at least) of guys being inserted into that first group. Q: How is the defensive line looking? Also does it appear that more 3 down linemen will be used? Meaning hand in the dirt not outside linebackers. A: I think the defensive line has been just a notch below the wide receivers in terms of overall performance. We’ve seen a lot out of Jay Tufele and Marlon Tuipulotu, as well as a boost in performance from Connor Murphy, and some really nice introductions to Drake Jackson and Nick Figueroa. I think we’ll see formations with two, three, and four down linemen this season. Q: Are you any more confident so far this year that Clancy may finally be getting the “if they’re good enough even as freshmen then play ‘em” memo? I know our shortage in the DB stocks may force his hand but i’m interested in whether you’ve noticed any change in his mindset this Spring. A: I think Drake Jackson will test that quickly. I also think this is where the simplification of the defense could come into play, as that would seem to give young players the ability to master the playbook more quickly than before. I don’t think we’re going to be able to truly tell anything on this front until the games start. It seems to me that Pendergast is more concerned with the floor of a player than his ceiling. If he puts you out on the field for an extended time, he has to know that the worst play you’re going to make doesn’t get the team killed on a long touchdown. And I think that’s where the disconnect lies between what he sees and what fans see. Fans see a guy like Palaie Gaoteote or some other dominant freshman as a potential All-American and a guy with the physical tools to play every down as a true freshman. But they might not see the mental mistakes that leave other defenders scrambling or cause defensive busts. Pendergast seems to believe that a guy who is maybe a step slower but knows the assignment will give up a four-yard run rather than roll the dice with a tackle for loss or a 70-yard touchdown. This is me reading into the situation a little bit after watching how Pendergast works for a few years, and it’s probably oversimplified, but I do think that’s where some of the disconnect is in terms of being on the same page. Q: Do you believe going forward Helton will make further changes to the structure of practices and perhaps incorporates a physically challenging, live tackling…etc into it? The second part of my question has to do with recruiting. Why doesn’t USC have more resources (like a dedicated staff) committed to recruiting? It seems like the Clemson, Alabama, and few others have a bigger staff, and generally are proactive about their recruiting methods! A: I think any change Helton is going to make to the structure of practice has been incorporated already. That was a long off-season with a ton of self-reflection and I can’t imagine that with the advanced planning you need to put a practice schedule together, that he will suddenly get some new ideas to incorporate. We’ll see if his plan includes ramping up the physicality as spring goes on, but at this point it’s safe to assume that he’s not going to have players go full speed tackling for extended amounts of time. Secondly, the resources are simply a result of how much you’re willing or able to put into the recruiting budget. Helton said he is comfortable with a six-person staff dedicated to recruiting, but that is going to lag behind he schools you mentioned. There are a couple of great recruiters on staff now as graduate assistants in Chris Hawkins and Viane Talamaivao, and they are able to assist with on-campus recruiting. The four new quality control assistants can recruit on campus as well, so there has definitely been an investment when it comes to the recruiting budget. It isn’t on par with the best recruiting programs in the country and I think it’s safe to assume that just isn’t going to happen. USC is going to recruit just fine though. A solid 2019 season on the field should put them right back in the top 10 nationally with the 2020 recruiting class.